I took this photo a few months ago, it I downloaded an app on my iPad called Snapseed. 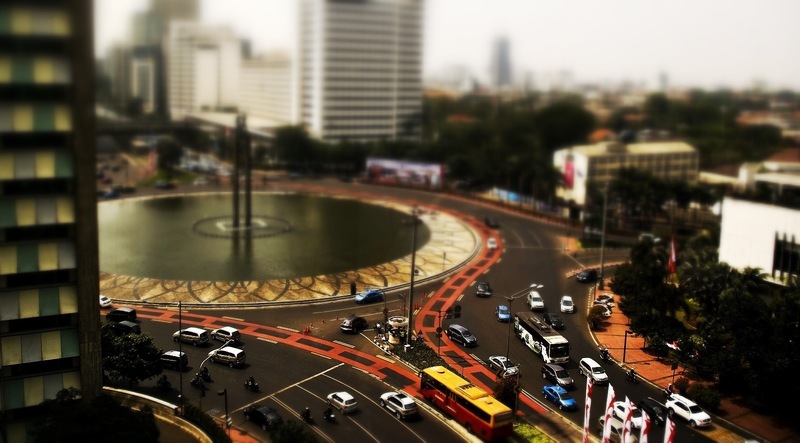 It has a “tilt-shift” process that turned my photo of the Selamat Datang traffic circle into what looks like a miniature diorama. So fun, but so weird. I resolved to get to know my city a bit better. I bought a motorcycle in the early days of December, and, now that it’s finally licensed, I’ve been driving it around my neighborhood. I bought it so that I could get to and from work more easily, but it’s offered so much more than a commuter vehicle ever could. Jakarta is an immeasurably large city. There are five areas, as far as I can tell, that actually make up the city of Jakarta: South (where I live), North, East, West, and Central. Then there are all the other towns, villages, cities that have been absorbed by the greater Jakarta area. On top of that, the council of people who plan out how the city develops seems to be non-existent. Streets start and stop, lead to suicidal corners and dead-ends, narrow to daredevil dimensions. If rhyme and reason play any part, they are a funeral dirge to the hopes of newcomers wishing to get to know their new city. Add to all of that the “macet” (literally translated as “jammed” – referring to Jak’s horrible traffic), and buying a car was out of the question. So I bought a motorcycle. What’s great is that, in the three or four days of driving it around my neighborhood, I’ve already scouted a number of places I had no idea existed. What you see above is an example of one of those places. 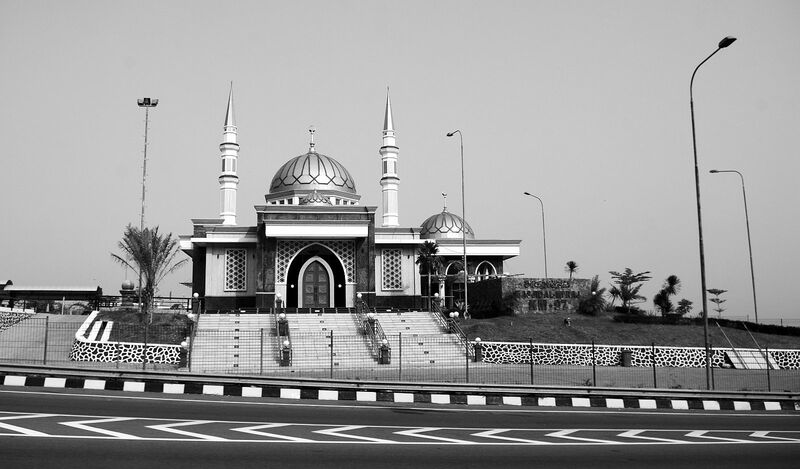 I particularly love the juxtaposition of the mosque and the graffiti. This week’s photo challenge is BIG. I am in Kuala Lumpur at the moment and found this very big James Bond overlooking a major traffic route. I guess they really like James Bond around here. I shot this from the window of the bus as I traveled from Jakarta to Bandung. We, my family and friends, went to Bandung for three reasons: outlet shopping, viewing a live volcano, and watching an angklung performance. On the way up, we passed a number of rest stops, but this one came with its own masjid, or mosque. Very beautiful, for a rest stop. PHD is Pizza Hut Delivery. They are delivery only. There are Pizza Hut restaurants all over South Asia, but in Jakarta there are Pizza Hut Delivery joints that are delivery only. That sounds like a good idea, but the pizza is kind of dodgy. The all-meat pizza has “sausage” on it, but I swear it’s hot dogs. The stuffed crust is pretty good, but I’ve yet to find a really good pizza here in the Big Durian. I do, however, love their delivery guys. 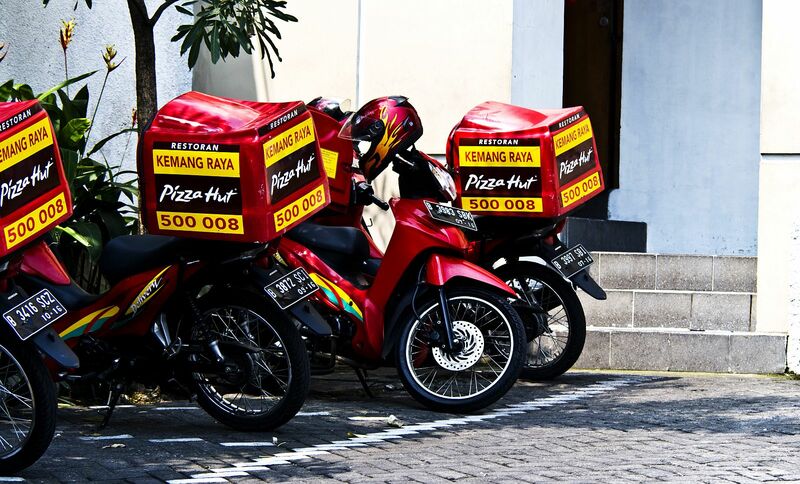 They fly around Kemang Raya (for those just tuning in, that’s the big road we’ve got going on here) delivering pizza very quickly riding on this fleet of red motorcycles, as you can see above.